Click here to sign up for the Daily Wisdoms Subscription. Each day's message goes out around 12:05 a.m. EST. Thank you for visiting! 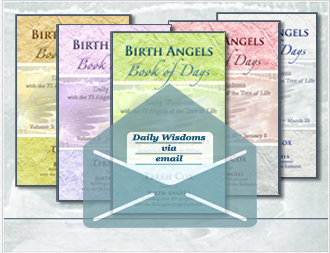 Below are sample(s) of Daily Wisdoms which are featured in both the Daily Wisdoms via Email Subscription Service and Birth Angels Book of Days, Volumes 1-5. Note that some of the messages in the Daily Wisdoms are short, some longer, and each with their own "personality." You do not have to study the messages, but rather notice what resonates and jumps out at you. There may be just a couple words or a sentence that touches on something you are currently experiencing. That's where the "power point" of the message is for you, and that is what you should carry into your day because it's relevant to you right now -- where all your power lies to do, be, change, grow and quantum leap into every next moment and thing you desire for a loving, true and meaningful life. It seems that MUMIAH, the last Angelic Energy of the 72-day cycle ending August 16, which supports us through "Endings and Rebirth," is coinciding today with the "waxing crescent" of the new moon in the western hemisphere. A wonderful synchronicity with the point that "every ending carries the seed of a new beginning!" Here is my aspiration: to look at, and especially to feel, any ending in my life "not as a loss or a darkening of light...but the first muted colors of a new dawn rising." I would love for that perspective to become instinctive, and I wish the same for you, as we begin and end every new today and move joyfully into every new beginning. I AM THAT WHICH...helps you to savor what has come to fruition and bask in the last sparkling flavors of the ‘now’ as it fades and leaves behind the gifts of life experience to prepare the way for something new. Life asks this of you: to embrace the ebb and flow of things and beings with the faith of knowing that forms fade so that the essence which remains may express itself in new ways. Revel in every last little bit of anything or anyone that graces your life, because whether you realize it fully yet or not, ‘what was’ has served you well! Let the seeds from the eaten fruit of your experience take root in the fertile loam of your new awareness. For every new now is but a season in the wholeness of your time here, and there are seasons and fruits yet to come. As ‘the bloom fades from the rose’ of every experience, learnings are plucked and new ideas and potentialities are already being seeded and nurtured in the infinite fields of your all-season heart. Every ending carries the seed-energies for rebirth and new life. Thus ‘leaf the past behind,’ and let yourself be carried by the winds of change into your next new field of endeavor and expression. As you take root again, welcome the gestation times when outer manifestation subsides to supply energies for inner growth. And in the meantime, our Angelic ‘light-incubator’ will help you to be at peace with what-was and what-is until what-will-be is ready to emerge. In relatings with others, we can help to illuminate truths that need to be told to yourself and the other so that difficult dynamics can be ended and the way prepared for something new between you. Or in a parting of ways, as the departing of a friend or loved one physically or emotionally, we can plant light-seeds of healing and acceptance that will sprout tender new growth when the soil of your heart is ready to receive. And consider this perspective, dear one:measure your life not by love won or lost, but how often love has brought the truth of you into greater beingness.